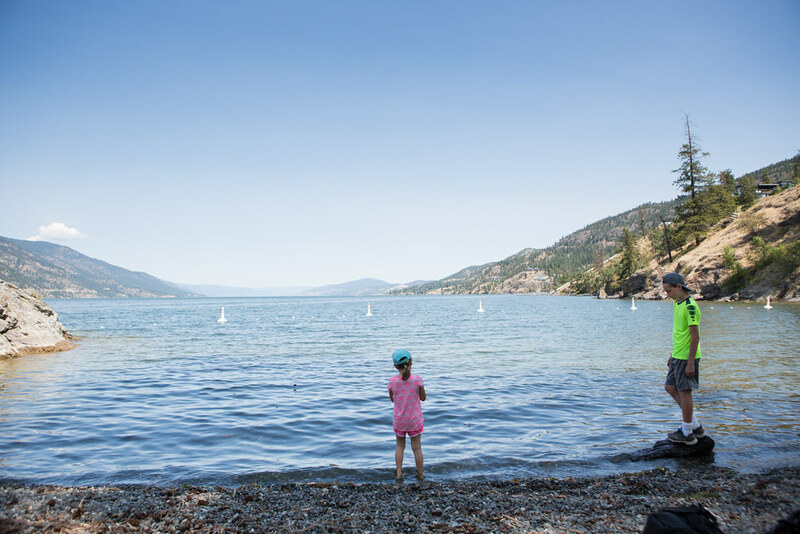 We recently visited Kelowna in the southern interior of B.C. 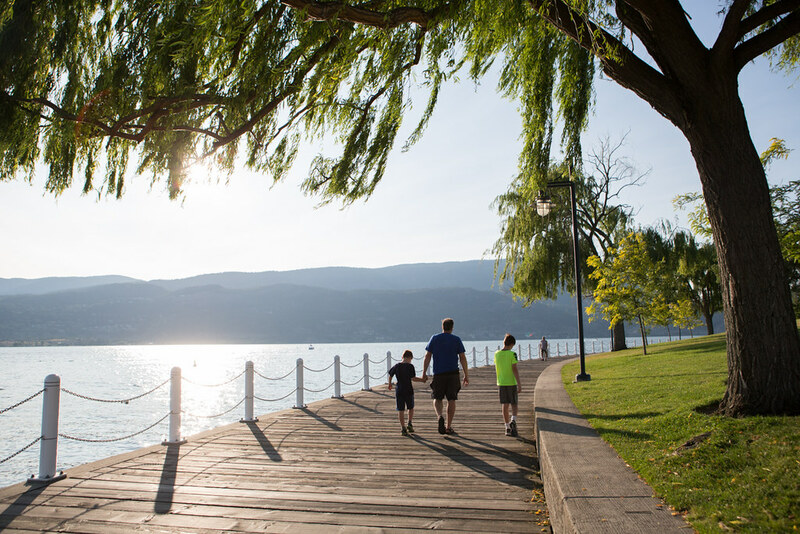 which is located just 3.5 hours from the Lower Mainland and right on the Okanagan Lake. 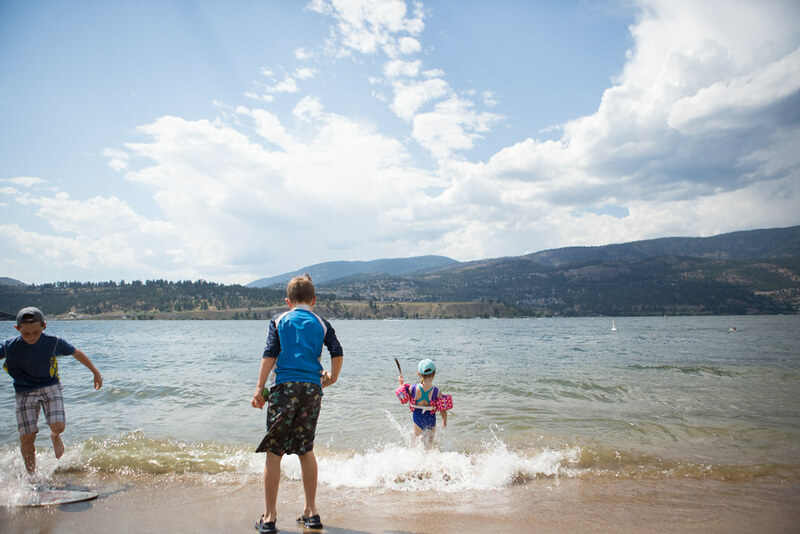 Our reason for planning a family vacation to Kelowna was threefold: a short road trip, numerous outdoor activities available and a beach vacation vibe. 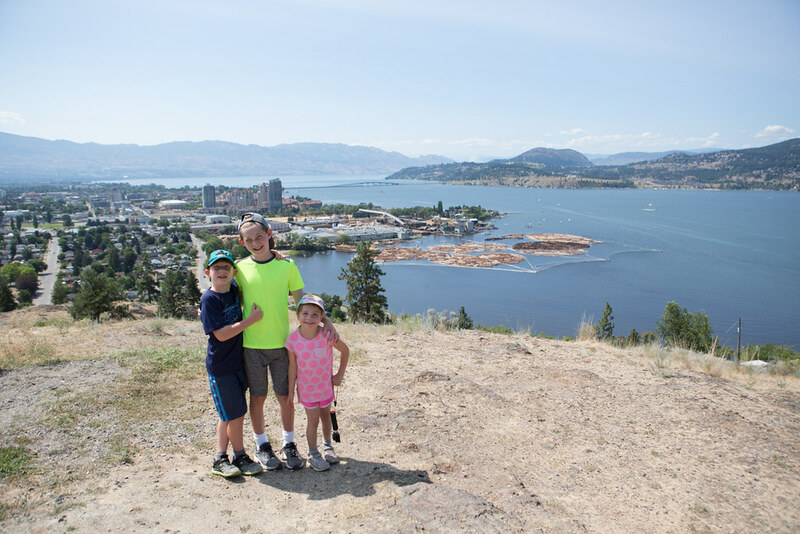 We ended up staying in West Kelowna as it was a bit more affordable which allowed us to do more activities each day. We were there for three days and I'd love to share the activities that were recommended to us that we enjoyed. 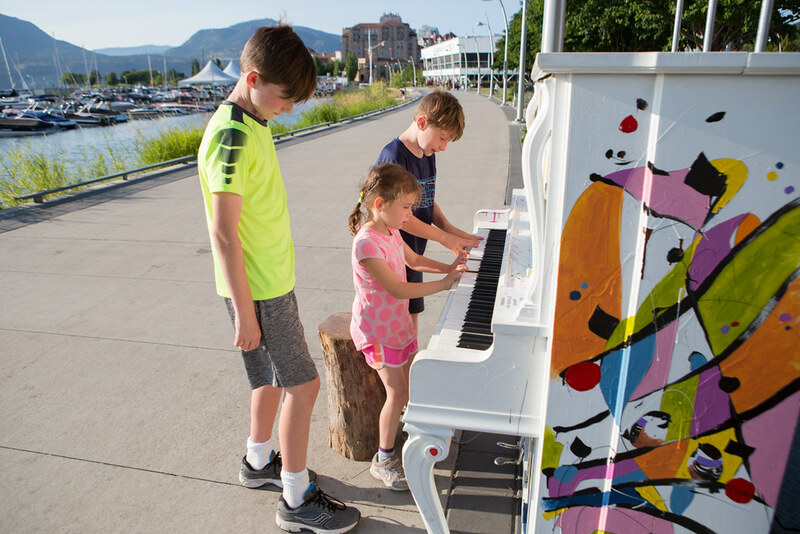 What are the five things I recommend doing with kids while visiting Kelowna? 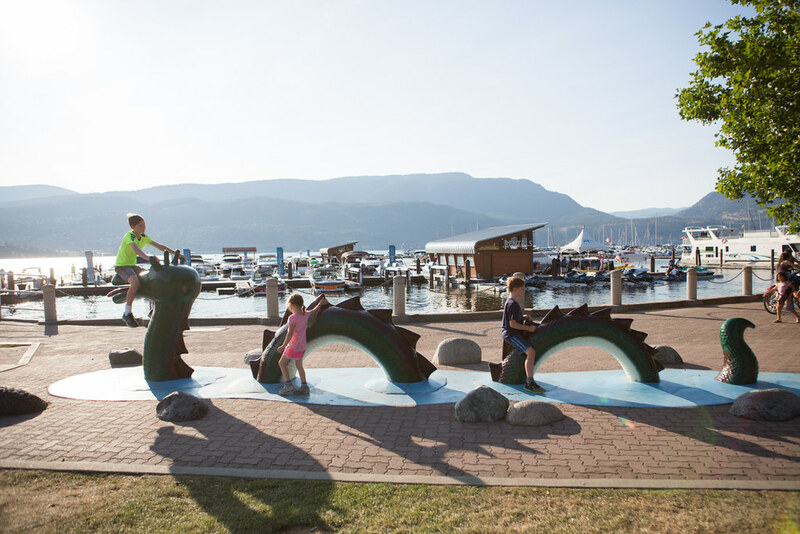 This park is located right over the bridge connecting to West Kelowna and has a wonderful beach (with shaded options), the Wibit (an inflatable waterpark) and a scenic beach-side walk all the way to Waterfront Park. 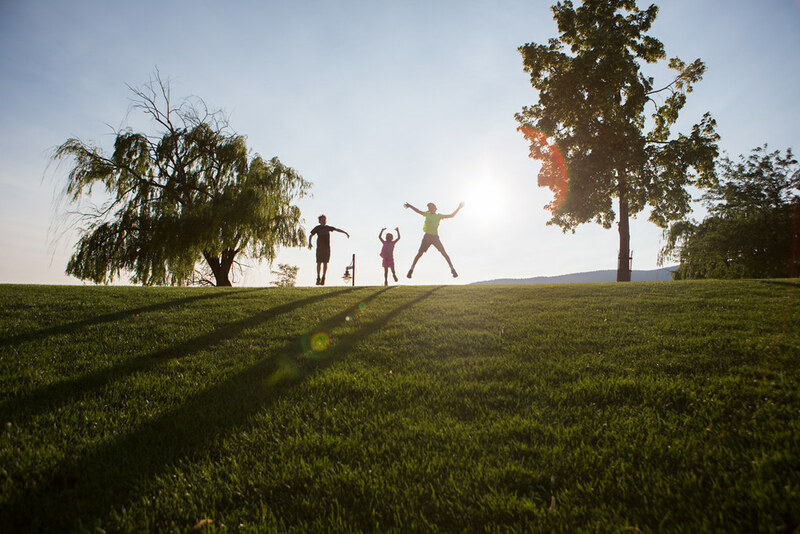 There are also playgrounds for the younger kids and ample change rooms and bathrooms. Parking was $6 for the day but free after 6 PM. If you are doing the Wibit it costs $25/day or you can go after 5:30 PM for $15 which is what we did. Children under the age of seven need a supervisor and the adult may go for free. Our six-year-old only lasted 20 minutes on it so I would recommend ages seven and up. My boys, nine and 11, had a wonderful time and played for about 1.5 hours. Taking the 20 minute walk to Waterfront Park gives you beautiful views and ample shade – it was especially pretty in the evening. 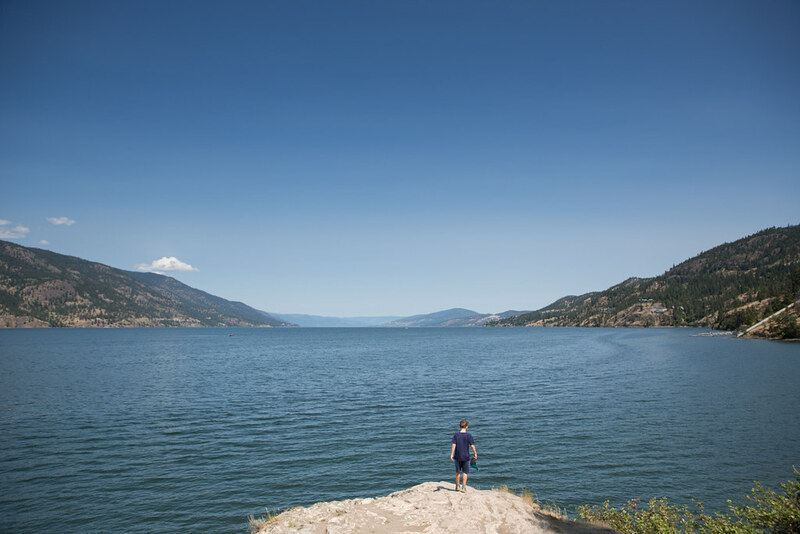 You'll also get to see the famous Ogopogo and the Visitor Centre is also located here so if you are needing any information, such as hiking maps, this is the place to go. There was a piano to play and the typical tourist chairs to get photos in. We even walked into an outdoor salsa lesson where Nya displayed some of her favourite moves. And pulled me in. I really recommend the short walk from City Park to Waterfront Park. There are a lot of places where you can stop in for a meal or treat as well. 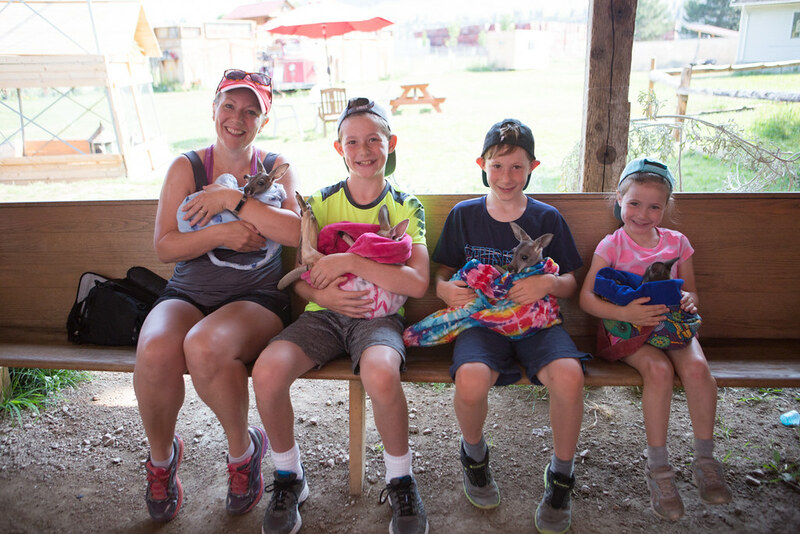 When we decided to visit the farm, I assumed we were doing it for the kids and I was wrong. I truly enjoyed it as well. 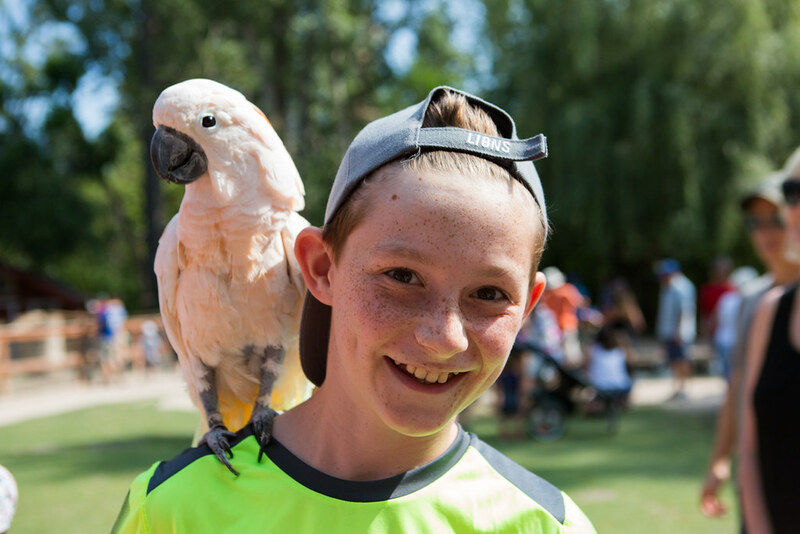 It is affordable at $10/adult and $5/child and kids four and under are free. 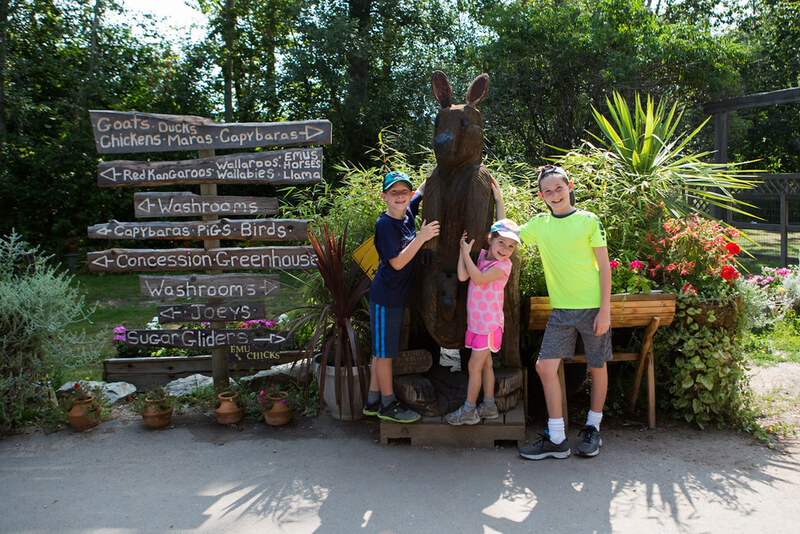 If you are planning on visiting, arrive before it opens in order to get in line to hold the joeys. We arrived at 9:45 AM and only had to wait ten minutes to hold them. We even saw them get their bottles–so sweet. 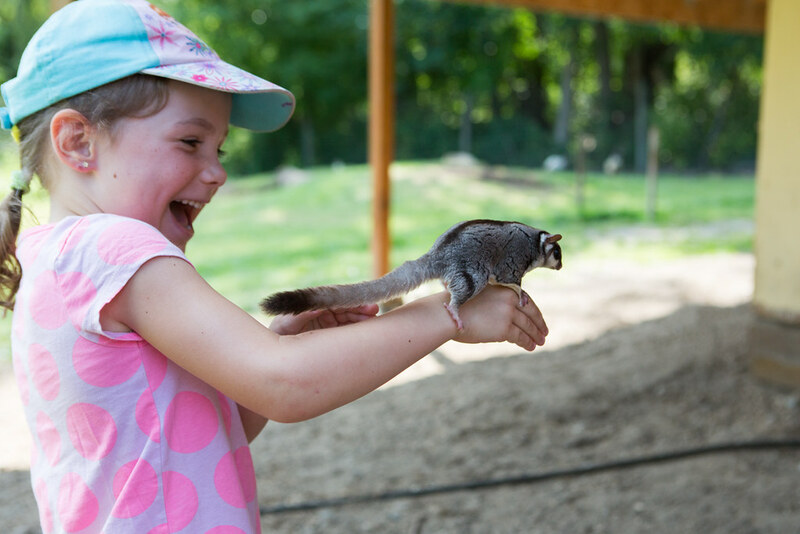 There are many other animals to interact with there from sugar gliders to parrots to capybara to kangaroos and more. 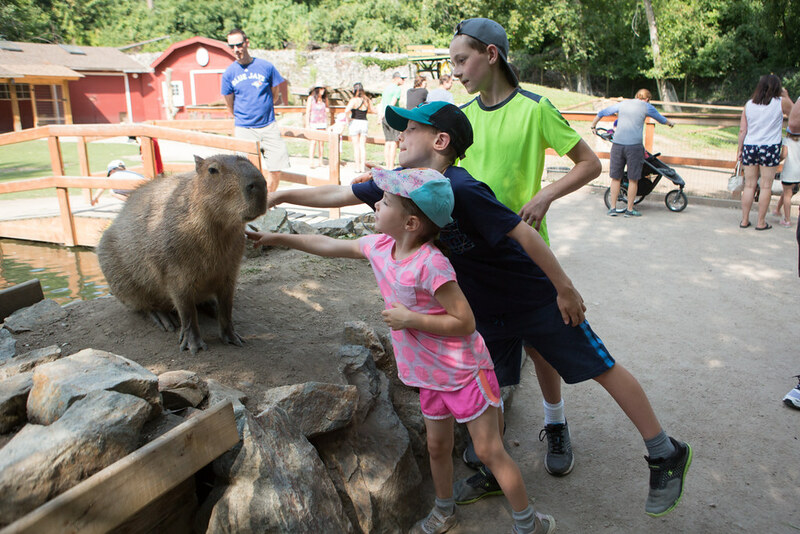 I appreciate that the hours are limited in order to respect the animals and the staff were all very kind and knowledgeable. 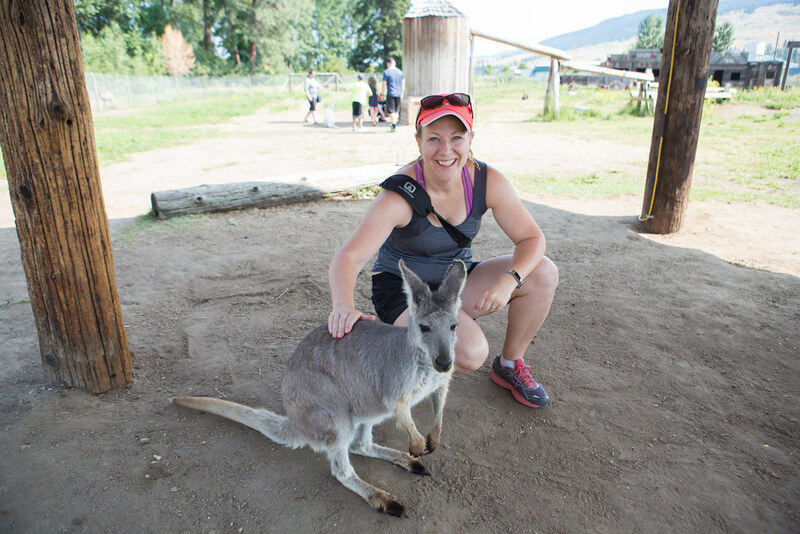 Did you know that to pet a kangaroo you need to move your hand in one direction on their back? Don't reverse direction or try to touch their face. 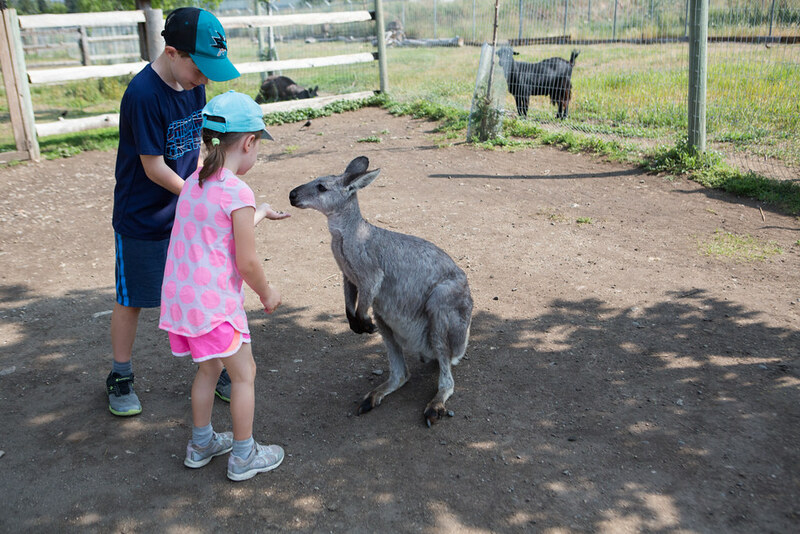 We were also able to feed the kangaroos (no extra cost) and they liked corn chips! 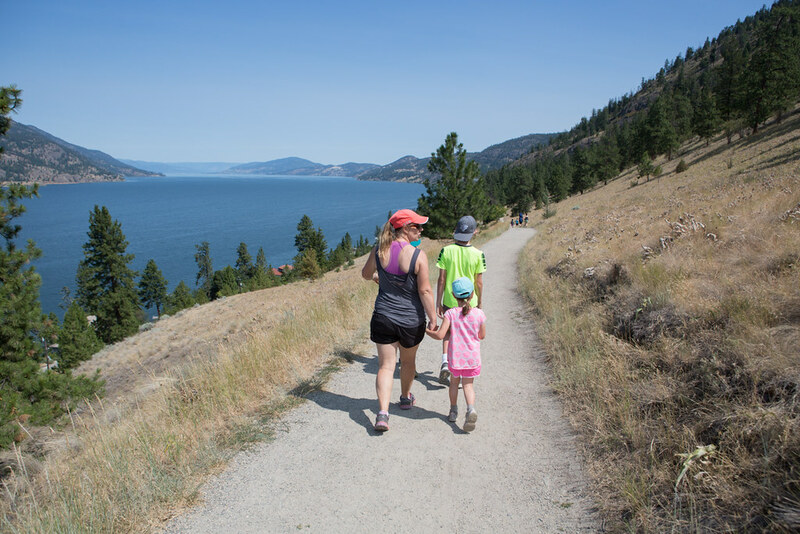 We wanted to do at least one hike while we were in Kelowna but with temperatures in the 30's we knew we wanted a simple one. We went with Paul's Tomb at Knox Mountain Park which is just minutes from downtown. One great part of this hike is that you can drive up to the parking lot and therefore start with a view! If we had started hiking around 9 AM we would've done the Apex Trail for a better view but we wanted to keep things simple. Paul's Tomb trail is about 2.5 km's in each direction taking one hour total. The gravel path is jogging stroller friendly and has a steady decline on the way there (and therefore incline the whole way back). At the end of the trail is a beach where the kids enjoyed throwing rocks in the water and having a picnic. 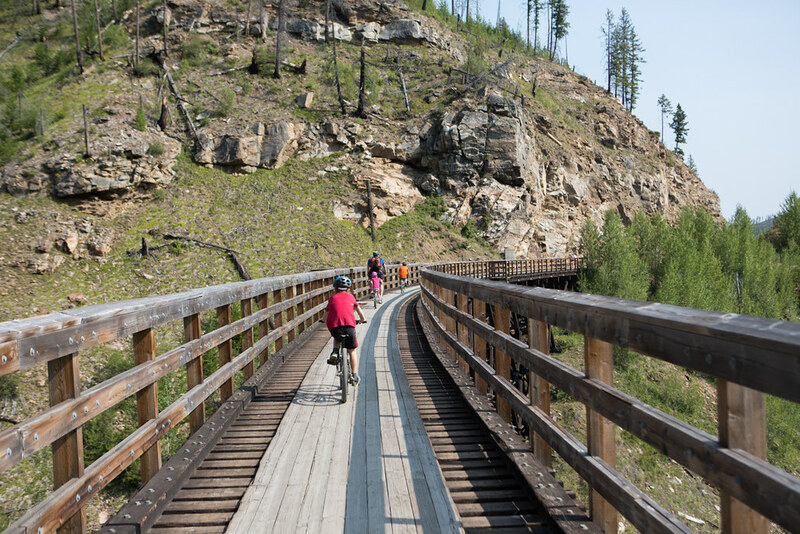 The main reason we went to Kelowna is that I have always dreamed of biking part of the Kettle Valley Trail. 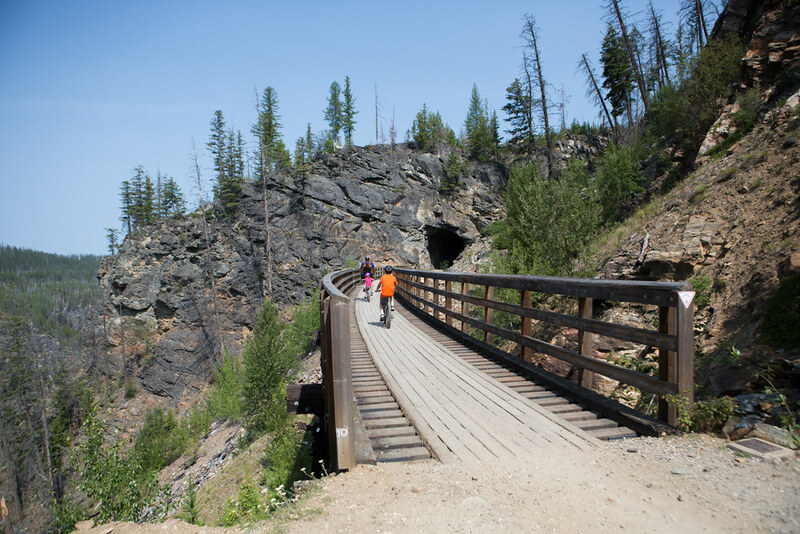 Myra Canyon Trestles is a 12 km bike ride over 18 trestles and through two tunnels and then you turn around at the end and get to see it all again for a total of 24 km. We weren't sure when planning our trip if we wanted to bring our bikes along because it's a bit tricky having it on our hitch and needing to get into our van frequently. There were several other reasons and therefore we decided we would walk as much of the trail as we could. The night before we were going to do it, we checked out Myra Canyon Bike Rentals and decided to rent. We would've only been able to hike half of it and this way we could see the whole thing. 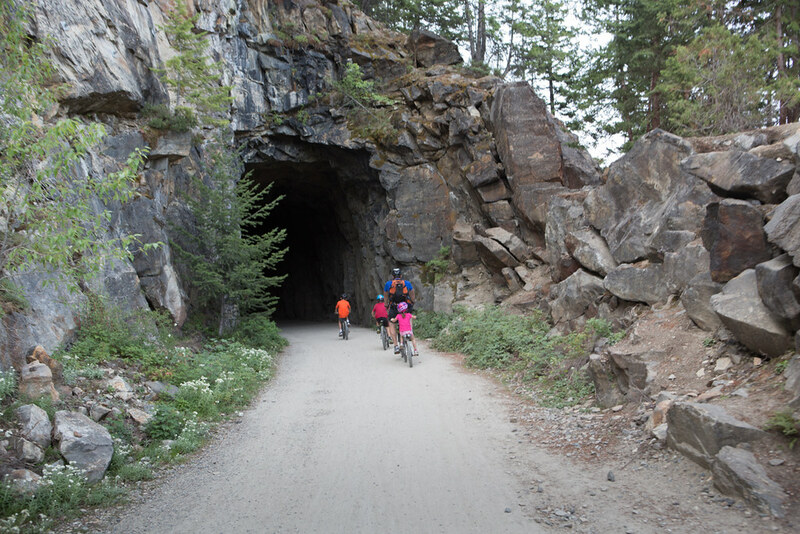 Our youngest was safe on the trail-a-bike and our middle son was instructed to stay on the mountain side of the path rather than the cliff. I'm so glad we did this and we were very happy with the rental company as well. Although the trail was 45 minutes from where we were staying it was well worth it and the highlight of our trip. 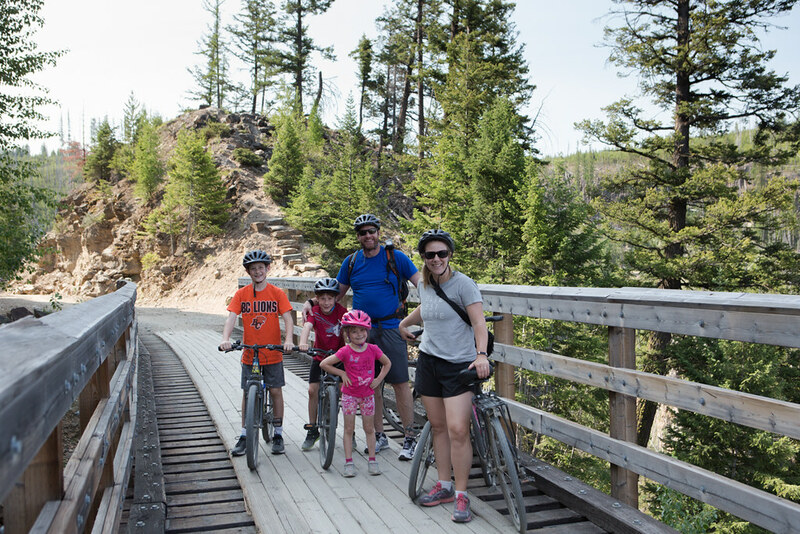 It took our family about 2.5 hours to bike the entire thing with several breaks in there. One thing I would recommend is doing it earlier in the day; we went from 9 AM until 11:30 AM and it was perfect temperature wise. Thankfully half of the trail is in the shade. Also note that there are outhouses at the begining, in the middle and at the end. Trail etiquette is to wait at the trestles to see if anyone is coming as it's only one direction at a time and therefore the other advantage of going earlier is that there are very few bikers. 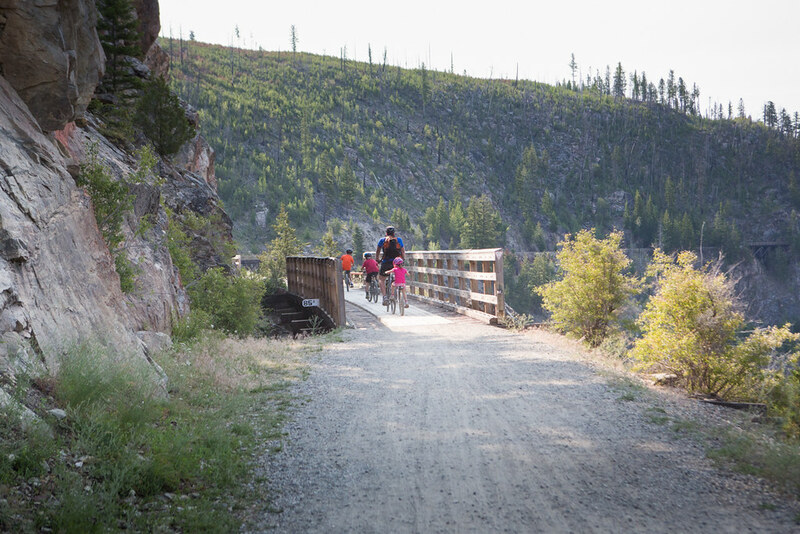 The main path is wide enough for bikers to travel in both directions. I wasn't going to have this as one of my top five but my kids insisted. You might think "Why would you go to an indoor waterpark when there are beaches everywhere?". Well, it was really hot all week and I was so tired of the sunscreen and sweating. 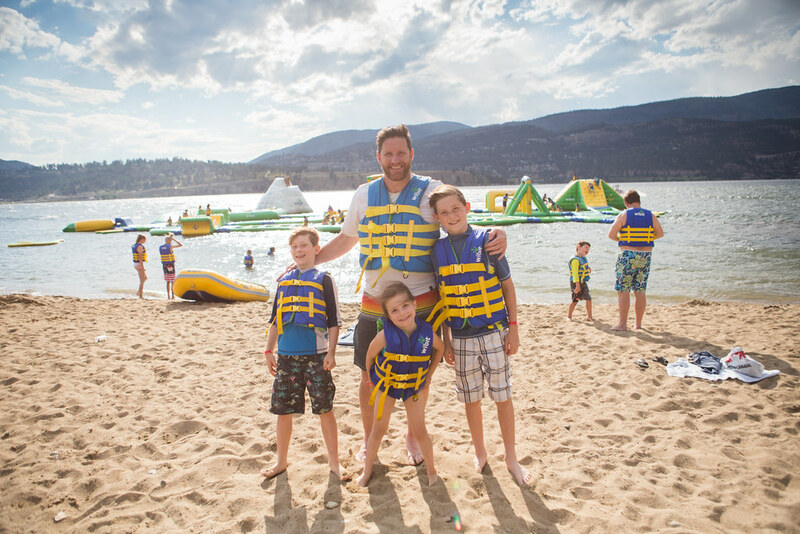 So, we hit up the H20 Adventure & Fitness Centre which was $28.00 for a drop-in family rate. They have a lazy river, wave pool, preschool area, Flowrider (which my boys did not attempt but will next time! ), hot tub and three waterslides. We were there for 1.5 hours and it was a perfect way to beat the heat after our morning of biking. 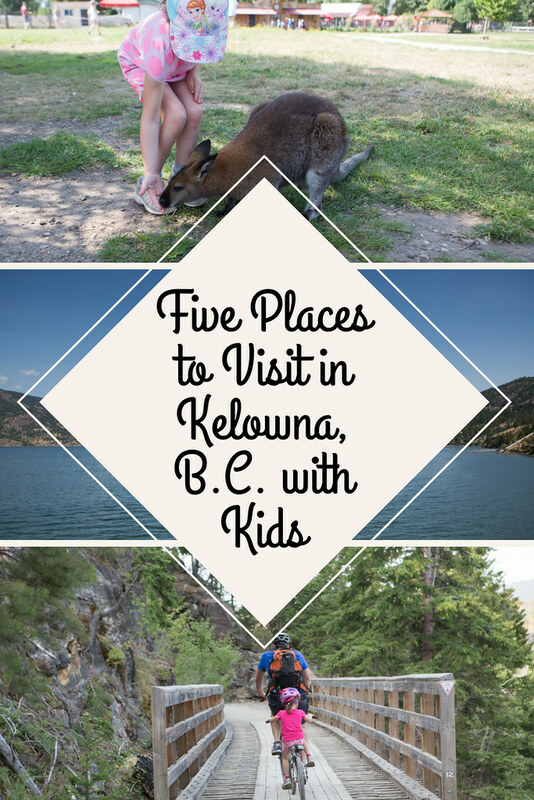 We loved our time in Kelowna and three days was perfect for us. We will definitely be back and I think there will be some parasailing in our future! What else would you recommend doing?